This post is part of the Wardrobe Architect 2015 series, led by Kristen, our patternmaker. Read more about it here and join the fun! 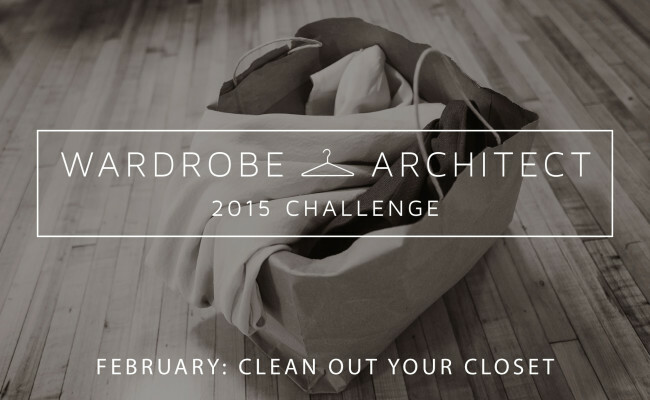 This month, your challenge was to clean out your closet. So how’d it go? Hopefully, you’re feeling the sense of calm that comes with decluttering and getting rid of the old, unwanted items that have been bogging you down. You could also be feeling a little lost, or nervous about your seemingly sparse closet. Depending on the state of your closet before you started, you may be left with a head start on creating your capsule wardrobe, or you may be feeling like you’re scraping the bottom of the barrel, wondering what you’ve gotten yourself into. Once you’ve done a closet clean out, one of the fastest ways to restore order is to tackle your mending and alterations pile as soon as possible. 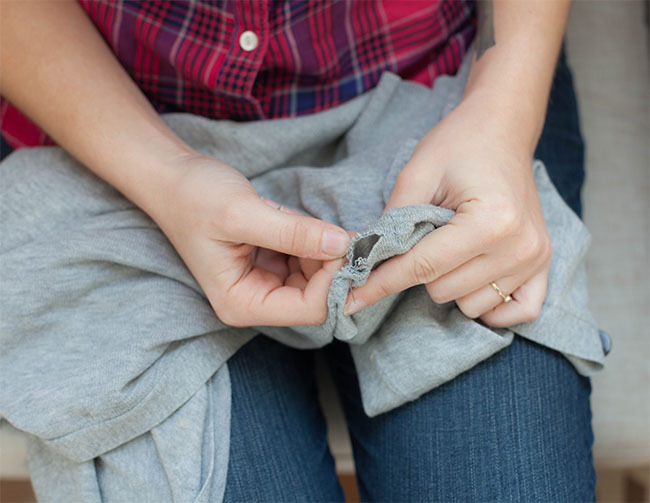 It can be tempting to dive right into sewing brand new items, but repurposing and mending is a practical approach that will leave you feeling proud of reusing what you already have. Pick a time. Depending on how large your pile is, you can choose to carve out an entire weekend to do mending and alterations, or you can space them out as a palette cleanser between larger sewing projects. Divide by color. To get started, I like to make a list, divide my pile by color, and assign each garment a thread color. Divide by sewing method. Next, I decide whether it needs to be mended or altered with a sewing machine, serger, or by hand. You may wind up needing different thread colors for every garment, but it’s nice information to have so you can avoid changing out your thread more often than you need to! For simple fixes, if you already have the color of thread you need on your machine from a larger project, it’s not a big deal quickly fix that tear along the seam of a jacket. Gather other supplies. 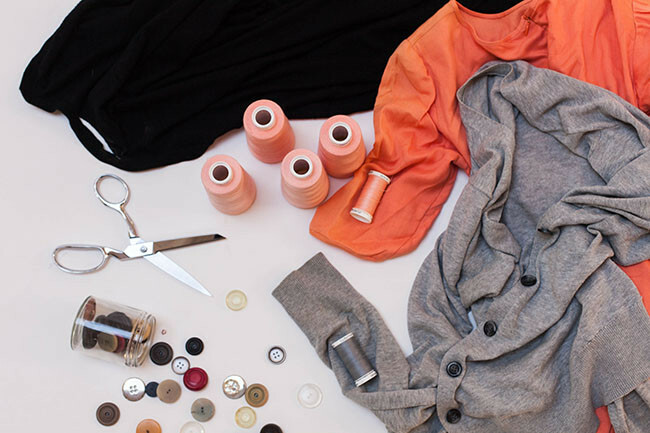 You’ll also want to gather all the supplies you need to fix each garment, such as buttons, trims, bias tape, or zippers. Keep mending at hand. I make sure to put the garments that need hand mending next to the couch so that I can work on them while watching TV or listening to podcasts in the evenings. Set a goal. 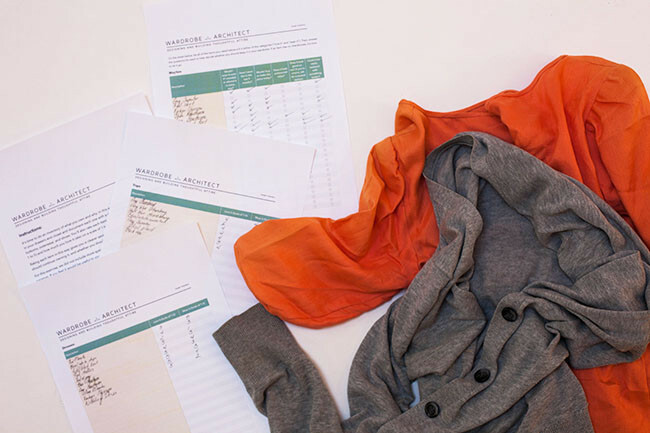 You may want to set a goal to fix one garment a day, or a few every weekend. It’s easy to put aside mending and alterations in favor of newer, more exciting projects, so whatever you do, it’s important to have a realistic plan that works for you. When I have a really large mending pile, I like to knock out all garments that require certain thread colors a day at a time. Invite friends. If you’re really struggling to motivate yourself you might consider hosting a mending clinic with some of your friends. Everyone has a pile of stuff they need to fix, so why not make it more fun for everyone with some food, drinks, and music? So now that you’ve cleaned out your closet, how do you feel? Do you feel more organized and in control, or are you already regretting some of your decisions? Did you learn anything new about yourself or your spending or sewing habits? Let me know how your February closet clean out went in the comments! Friday chatter: How often do you clean out your closet? Getting rid of some of that stuff was a weight off my shoulders. I had a lot of items that I loved, but didn’t love to wear. Eventually I started feeling guilty about not wearing them. That’s how a cocktail dress becomes a closet albatross. I totally need a push to finish my mending. Oh, and my ironing. Wearing sweaters every day means I get away with ignoring my ironables for weeks on end. I really enjoyed this process. I love the feeling of a fresh start and a toned down wardrobe. I try to go through my wardrobe once a year, but this time I was more scrutinizing about the process and ended up with a very large pile waiting for a good clothing swap. I feel as if I came away with a great start to a capsule wardrobe. As for the mending, that may need more than one reminder to get finished . Inviting friends works! I host mending parties about four times a year — everyone drinks and eats a lot, and most of us get some good work done before we’re too full and tipsy. It’s also great because it’s a beautiful skills-exchange — one person might know how to sew on buttons but needs to learn how to repair a crocheted edge, one might know how to darn by hand but need help threading a machine, etc. In the end everyone does the mending because there’s an occasion, and we do a better job of it because we can draw on each others’ skills and expertise. Highly recommended, four stars, would mend again. This is such a good idea! I have sewing/craft gatherings from time to time, and I’m totally doing a mending-themed one next. I have a bunch of handknit sweaters that I never wear because there’s something I don’t like about them (usually the neckline – too high and I feel like I’m being choked all day). It’s not the most fun knitting project to work on something I feel like I already finished, but I will have so many more wearable items if I can just get these fixes done. I’m not letting myself buy new sweater quantities of yarn until I fix these sweaters! I just read the book The Life-Changing Magic of Tidying Up and, based on that, cleaned out not just my closet but my entire flat. In a nutshell, the author’s recommendation is that you should go through all your belongings, choose only the items that give you joy, and get rid of the rest. The biggest difference from your blog post was an emphasis on getting rid of more of the maybes. If you don’t love it and wouldn’t buy it out shopping today, why crowd your home with it? Everything feels so much more spacious, and I feel like I have more energy at home because I’m surrounded by things that I really like. One really nice part of the process was a satisfying way to part with sentimental items I won’t use again. The author recommends that you carefully fold the item and then thank it for serving its purpose in your life and then sending it on its way. And now I need to get through my mending pile. I’ve hosted some crafternoons in the past, and I think extending it to a mending party would be a great idea. The whole office was just talking about wanting to get that book this morning! I cannot recommend it highly enough. I’ve never been anything close to a tidy person, and I’ve managed to keep my whole flat spotless since I purged and organized. i read, and really liked the book, and, yes, apply it to my whole house. my one very large criticism of it is that it doesn’t help with where the stuff should go after you’ve thanked it for it’s service. i just cannot, will not, take those forty bags of discards to the dump…. so there’s is the after-problem of where to store it until the fire department garage sale, the trip to goodwill, the call to the humane society to see if they want some of it, fashionproject.com to see if they’ll take any of the brands in the discard pile, the used book store to see if they want anything from that box, the internet to figure out if it’s okay to burn encyclopedias – ’cause nobody wants those – and what about the stuff the children left behind? I bet that you could put encyclopedias up on Craigslist and someone will come for them. I’ve read articles bemoaning the lack of a beautiful physical alphabetical trove of knowledge. Wikipedia and its ilk don’t allow for such unstructured knowledge digging since you’ve got to know what you’re searching for; you need a hard copy for real exploration. On the general stuff, I think I’m lucky about where I live. There’s a once-monthly free market gathering held in a local park. My best discards are sitting on the shelf that I managed to empty until the market convenes. And the public trash collection service here actually collects old clothes for recycling a few days a week. And I purged a lot of stuff a few years ago before I moved abroad when I lived two blocks down from a Goodwill dropoff point. The weekend’s coming up. Can you fit a couple of those disposition chores in then? The garage sale will have to wait, but Goodwill and the phone calls can go soon, right? There was the section in the book on sending things to parents’ houses in the country. I don’t remember it too clearly because it doesn’t really apply to me, but IIFC, she said the mother and daughter pair couldn’t graduate until they dealt with the stuff the daughter sent out to the mom’s house, and then when the daughter went through it, she found very little that she wanted to save. Could you send the kids a copy of the book and then invite them for a fun weekend where they clean out all their stuff? I went through all my scrap fabric. About 70% of the volume went. I picked up each piece and asked myself if it was worth taking care of and if I could see myself actually using it in the future. What’s left all fits in one box, and it’s all carefully folded so they’re all vertical, and I can see all the scraps I have at a quick glance. Quite a difference from a bunch of bags that I had to dig through to find anything I wanted. I listened to the audiobook (you can find it here: https://www.youtube.com/watch?v=hKgS0PA3E7s) and I have to say it really is life-changing! I’ve always been a tidy person. Living and working in a messy enviromnet is stressfull for me. It takes away my feeling of safety. I find some sort of pleasure in tidying, it helps me relax. But using the Marie Kondo method opened my eyes to all sorts of other things about m life – even the ones not related with tidying at all. I REALLY, REALLY RECOMMEND THIS BOOK! I postponed the clost-purge so many times already, but now I finally had the nerve to do it. And it feels so good! I would say that I don’t have that many clothes and especially not many that I don’t wear often, but that’s actually not quite true… I got rid of things that don’t fit me, my style, are just too worn, that I don’t really like… I gave everything to my sister, she can now pick the things she likes, the rest will be donated. And I’m given all the free space in return, it’s ridiculous how happy that makes me! Hi! We recently moved countries and have just taken the bare bones of my old Handmade wardrobe. The only trap has been that Shanghai is VERY season compared to our old country… so I had to buy a proper winter jacket for the first time! I plan to go through my wardrobe (and Husbie’s and son’s) at the turn of every season to sort through just like this! I found it hard to say goodbye to many of my handmade dresses when we moved, but I wore them so much and you can pass that love on! p.s. if i notice something needs mending when i’m doing the laundry, it goes directly to my sewing space. doesn’t go back in the closet if it’s in need of repair. i’m good at, and actually enjoy, mending. i get a lot of satisfaction out of extending the usable life of something loved enough to need mending, and sometimes you have a real opportunity to get creative in order to come up with an effective fix. also, there are things you should just pitch – like holey socks – because they defeat the time + funds = utility + satisfaction equation so completely. I do agree that a time comes when something is truly worn out and there’s nothing for it but the textile recycling bag (Goodwill takes worn out clothes and fabric scraps for this purpose, which I love that they do). But, I just fixed a bunch of socks! If they only have one or two worn places, and the rest of the sock looks good, it seems ridiculous to waste them. It’s not my favorite thing to sew, but now that they’re just about done my sock drawer is so full and happy. It felt wonderful to organize my closet. But I’m so disappointed with my inventory, everything is a duplicate of something else in a different color. I want to get rid of so much of it, but if I did I wouldn’t have anything to wear! I’m really looking forward to the rest of the series so I can make a wardrobe I’m happy with. It has been really freeing and energising to let go of all the things in my wardrobe that I didn’t want anymore. I especially have problems throwing away things that I have been given, but doing that and taking stock of what I need has really focused my sewing energies. Now that I have a good idea of what I need, I enjoy my sewing so much more. I light a scented candle, close the door to my sewing room and can get completely absorbed into the process, knowing that I am making something that I need. I didn’t expect that to be a happy consequence of cleaning out my wardrobe! I did my closet purge last summer, so I took February as a break. That was a mistake since I feel a little lost in the process. Honestly, I think I should do a purge again. I still look in there and feel like I have nothing to wear. to echo others, it was very liberating to let go of much of my closet, and then zealously catalog everything that’s left. I felt giddy! It actually took me a lot less time than expected (about 2 hours sorting/cleaning), and I’m so much happier getting dressed in the mornings now that my closet is pared down to things I love. It’s so much easier to pick one piece (like the blouse I feel like wearing that day), then think of which of my “core style” silhouettes it fits into, and pick the other clothes accordingly. Glad you paired this post with mending tips though, because my mending pile is a little out of control! Love the idea of making it social. Getting rid of stuff was a relief this month. Unfortunately there were somethings I couldn’t get rid of until I replace them. I don’t own a singe pair of trousers or a spring jacket that I really love. I’m debating whether or not to buy or sew each item. I know that I won’t have time to sew everything I need, but I don’t want to hang on to a frumpy looking coat just because I don’t have a better option. I think that it is fine to buy things, as well as sew, especially if you have a lot of replacement to do. Sewing everything can take a really long time. Fortunately, a lot of companies have constant sales. For example, I really like Talbot’s wrinkle free shirts/blouses. Normally, they are about $80. But if you check the sale page on their website, these shirts are often on sale. In the past, I have purchased them for as little as $25. Hopefully you will be doing a lot of sewing for your capsule wardrobe this year! If sewing a new pair of pants isn’t high on the list of projects that excite you, and you know you really need a new pair you should go ahead and buy something you’ll feel good about wearing. I like the ideas around the sentimental pile. My sentimental clothes are in a zipped up bag with a tag saying “clothes I can’t seem to throw away”. They include some of my best sewn pieces which I no longer wear. Maybe I’ll tackle them now using some of the ideas in your articles and the posts. For a few years now, twice a year I clean out my wardrobe, around April and October. I wash or dry clean everything which is out of the on-coming season, throw out things from the passing season which on reflection I don’t think I will wear again. We have a local op-shop (thrift shop) which is open on weekends so even when I only have a few things to throw away I take them there. I take down the very large zipped bag on an upper wardrobe shelf which has the very summery/wintry things for the on-coming season. I look for gaps in outfits and check that everything I hang can work in at least one outfit. I usually find I need more black pants and it is always interesting to see what shoes I really need to go with things. Over several weeks the clothes out of storage get ironed (by my husband). I put my cleaned very summer/wintry clothes on the high shelf. Now when I plan my sewing and purchasing I write a list based on work/play/going out and on colour themes. It sounds like a lot of work but it only takes a couple of hours over successive weekends and since I have been doing this, shopping, sewing and planing what to wear has been much less of a drama. I feel terrific about cleaning out my closet. I found several things that I had not seen in a LONG time and now have them washed and ready to wear. Haha, it’s amazing how much emotional value clothes and objects can take on. Over the years I’ve gotten better at evaluating what’s actually meaningful and what I can toss, but it’s not easy! I love the mending advice, about grouping by thread color. That does make it go better (and I enjoy mending/remaking); thank you! I’ve purged my wardrobe to the point it is all loved and joyful. Still a little too much; I need to work on the “really never going to fit that again, let it go” stragglers in the back. I utterly failed this month. I went through a small portion of my closet and was ruthless in only keeping what I wear often and love and I put everything else in two piles…”hell no” and “maybe”. I really do love the idea of only having what you love in your closet and maybe I can go through it AFTER I make some stuff to fill it and make me happy. Or is it that important that I do it before I fill it? Please help! Give me suggestions on what to do!! It seems like you’re starting from a place where there is very little to work with, so in your case, I would do as you suggest and make and buy some things (unless you’re on a clothing fast) that make you happy before you do another clean out. I hear ya. Getting rid of clothes can be so emotionally draining. In the end, I decided to hang on to a lot of stuff, but I keep it out of sight in storage. This makes it a lot easier to evaluate my current wardrobe and not get overwhelmed. I have already gone through my closet last year before I moved to my new house and have it all in a box that didn’t make the cut…I think after I make some things that I really love I will start to weed out the ones that aren’t that great. I started my wardrobe clear out enthusiastically, but found it really hard to let things go. I have many clothes I no longer wear, but like the colour or the fabric, so I kept thinking I could use the fabric to make something I would wear, or change the garment to make it fit better. However this means it’s all still sitting in my wardrobe waiting for me to have time to do this – which I may never do. Should I take all those things and put them in a ‘to be altered pile? Should I leave only the things I do wear in the wardrobe? I love purging and going through things so this exercise was really easy for me. Now that everything is cleared out I can prioritize what needs to be put at the top of my sewing list and what I can wait on. I have a little more work in my handknit wardrobe as several sweaters need to be frogged in order to be re-knit into sweaters that work with the rest of my wardrobe but overall I’m really happy with the results of my closet clear-out (and I have lots of empty hangers and drawer space ready for handmade items). I started mending my family’s clothes about six months ago. It is amazing how easy it is to save clothes that I would have eliminated in years past. I pull the clothes that need mending on the weekend as I do laundry and try to get them all mended a sunday night. Whenever I wear the mended clothes I feel like I have an invisible badge that says “Mend and Make Do”. My husband disagrees with me about the value of patching one of my sons $6 sweatpants, but I think the patches give my sons’ clothes character and save perfectly good pants from filling up a landfill. I’ve really enjoyed doing my wardrobe purge. So much went to the op shop, but there is a smallish(!) amount I’ve stored in a suitcase in my garage, in a kind of limbo. For some reason, I can’t take them to the op shop yet – I think I am concerned that as the seasons change I won’t have enough to wear, even though some of it I am sick of wearing for years. It has been a really clarifying activity because now, as I look at the surviving pieces in my wardrobe, I know what it is about each piece that I love – colour, style, shape, fabric. Reading through the 2014 Wardrobe Challenge helped with this a lot, as well as an afternoon personal style workshop at my local adult education centre. I am so happy there’s a 2015 Wardrobe Architect! Thanks for all the tips, ideas and help -and I love reading everyone’s comments. Creating a new wardrobe is a fun, creative and ongoing process….. This one was tough for me. I clean out my wardrobe once a year, but I’ve never been this strict! There are some before and after pictures on my blog, if you’re interested. I got rid of nearly 1/3 of my closet, but it doesn’t look like that… That was really shocking for me! :D But I’m happy with my results (even if you can’t see them) and I do feel kinf of relieved.